Community Supported Agriculture is a unique agriculture system where community members pledge their support to a local farm by paying an upfront fee for a share of vegetables. This money allows the farmers to cover costs such as seeds, tools, compost, and equipment before the season begins. In return, the farmers provide weekly shares of fresh produce throughout the growing season. In this mutually beneficial system, consumers and producers share the risks and rewards associated with farming. We think it's a win-win! * Delivery is $6 per week but free for those that can pick-up from our two farm locations. * For bi-weekly orders, choose which Share Option that fits and pay half of the total cost. * To save on delivery, cluster 5 of your friends and we will dropship! A $100 deposit is required to reserve a CSA share. We encourage members to pay the remaining balance ASAP to help us cover early season start-up costs. Shares can be paid through instalments, please contact us to discuss a plan that will work for you. Remaining balance can be paid via cash, cheque or e-transfer. Each week you'll receive a share filled with seasonal, organic vegetables, grown lovingly by us! For a full list of what we grow, visit our What We Grow page. We know that choice is important to our members. 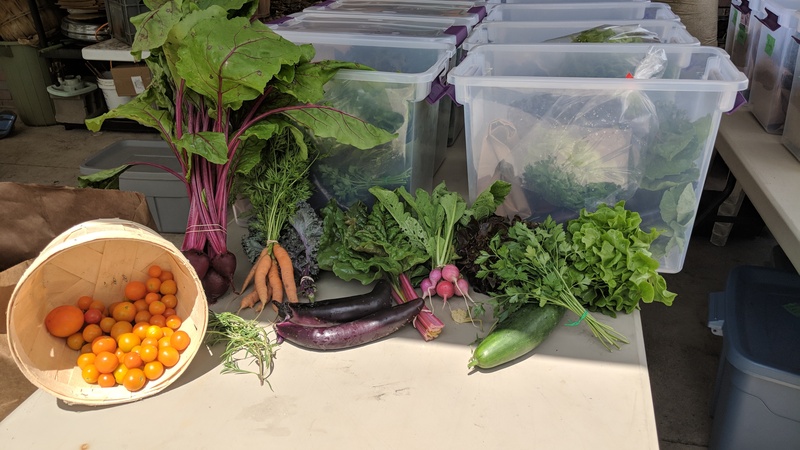 At each CSA pickup, we encourage members to customize their shares by swapping out veggies they don't want for ones that they do. The CSA program starts in Mid-May and runs for 24 weeks, ending at the end of October.